Extension professionals are faced with a challenge to present complex data in simple, understandable information to decision makers. Most often, this information is visualized in the form of maps, charts, and infographics to understand patterns in communities. This webinar will include a discussion of the data, tools and methods used by three experts to help communities visualize information. The panel discussion will focus on innovative methods to generate, track and communicate information to community and economic development stakeholders. The National Sustainability Summit & National Extension Energy Summit is a forum for connection and exchange at the nexus of science and stewardship. Join fellow Extension agents, educators, researchers, students, community partners, and sustainability and energy leaders from across the U.S. at this joint national conference. Learn about the latest research, exchange innovative programming strategies, update or reinvigorate your educational toolbox, and cultivate new communities of practice around ENERGY, WATER, FOOD SYSTEMS, LAND, CLIMATE, AND COMMUNITY RESILIENCE. SRDC has secured funding from Walmart to strengthen retail, accommodations, tourism, and entertainment industries which often make up a large portion of the jobs and businesses that drive rural economies. The SRDC will collaborate on this initiative with three of its Southern Region Land-Grant University (LGU) partners: University of Arkansas System Division of Agriculture Cooperative Extension Service, University of Kentucky, and Oklahoma State University. Community and Economic Development specialists from each university, Dr. Stacey McCullough (AR), Dr. Alison Davis (KY), and Dr. Dave Shideler (OK), will lead the project team in their respective states to develop, refine, and pilot a process to help rural communities strengthen their retail sector. Each state selected two multi-county regions to participate in CREATE BRIDGES, Celebrating REtail, Accommodations, Tourism, and Entertainment by Building Rural Innovations and Developing Growth Economies. In Arkansas, the two regions include the Ozark Gateway region (Sharp, Fulton, and Izard counties) and the Little River, Sevier, and Howard region. Kentucky’s regions include EKCEP (Bell, Jackson, Clay, Leslie, Harlan, Owsley, Perry, and Lee counties) and Big Sandy (Floyd, Johnson, Magoffin, Martin, and Pike counties). In Oklahoma, the regions include the Sandstone Hills region (Creek, Osage, and Pawnee counties) and the Crossing Borders region (Adair, Cherokee, Delaware, Mayes, and Sequoyah counties). Each state project team will lead their state’s respective regions through the CREATE BRIDGES process. Extension stakeholders, most notably county commissioners, often need to justify their decisions to continue funding Extension and need more than evaluation data on program outcomes. They want to know the economic benefits of their Extension funding in their communities. This webinar provides two case studies of evaluation efforts to document the return on investment of Extension programming. Rebecca Sero will describe efforts to document the economic impact of all Extension programming in two counties in Washington state. Brigid Tuck, Catie Rasmussen and Scott Chazdon will present their study of return on investment for a leadership program in McLeod County, Minnesota. Both of these efforts combined quantitative and qualitative methods to collect data on the dollar value of Extension programming. The session is moderated by Sreedhar Upendram, an Assistant Professor in Agricultural Economics at University of Tennessee Extension with expertise in Economic Impact Analysis. This research was created as part of Sera 47 - Strengthening the Southern Region Extension and Research System to Support Local & Regional Foods Needs and Priorities. This applied research was financially supported by Mississippi State University Extension, the Department of Agricultural Economics, and the Southern Rural Development Center at Mississippi State University. Would you like to understand how communities work? Are you curious about why good ideas sometimes fall flat? Do you watch groups struggle to make decisions without adequate data? If you answered “yes” to any of these questions we invite you to register for Understanding Communities and Their Dynamics, a unique online course presented jointly by the four Regional Rural Development Centers and a team of nationally recognized Community Development professionals. The seven-week series begins Wednesday, September 12, 2018 and concludes Wednesday, October 24, 2018. Each week features a 90-minute webinar focusing on topics including demographics, economic development, strategic planning and power structures. Supplemental resources and online discussion opportunities will be available on the course website. Participants are encouraged to log in at their convenience throughout the course to explore these topics further, pose questions, investigate additional resources and visit with colleagues in similar situations. All sessions are recorded and available on the website. Understanding Communities and Their Dynamics is an introduction to community development. It is appropriate for individuals working with community groups in any subject area. Past participants include those working in agriculture, economic development, youth development, entrepreneurship, nutrition, energy and natural resource-related issues. If you find yourself called upon to facilitate community-based initiatives, or you just want to better understand how communities function, this course is for you! The US Department of Agriculture, National Institute of Food and Agriculture (NIFA) is pleased to announce the release of Requests for Applications (RFA) to fund a new project for the fiscal year 2018 Children, Youth and Families At-Risk Professional Development and Technical Assistance Grant. The mission of the CYFAR Grant Program is to marshal resources of the Land-Grant and Cooperative Extension Systems so that, in collaboration with other organizations, they can develop and deliver educational programs that equip youth who are at risk for not meeting basic human needs with the skills they need to lead positive, productive, contributing lives. The Centers for Medicare & Medicaid Services today released the agency's strategy to promote high-quality health care for all rural Americans, address the unique economics of providing rural health care, and bring a rural focus to CMS health care delivery and payment reforms. Developed by the agency's Rural Health Council with stakeholder input, the strategy calls for CMS to "apply a rural lens" to its programs and policies; improve access to care through provider engagement and support; advance telehealth and telemedicine; empower patients to make decisions about their care; and leverage partnerships with stakeholders to achieve the stated goals. CMS said the strategy also aligns with the goals of the Health Resources and Services Administration's Office of Rural Health Policy and other administration priorities, such as reducing regulatory burden and combating the opioid epidemic. "AHA is pleased CMS put forward thoughtful recommendations to address the unique challenges of providing care to patients in rural communities," said Joanna Hiatt Kim, AHA vice president of payment policy. "We look forward to working with CMS and Congress to take meaningful action to stabilize access in rural communities, such as creating new alternative payment models, expanding coverage of telemedicine and access to broadband, and reducing regulatory burden." Measuring the impact of work community development professionals engage in is critical to ensure its continuation. While many focus on quantitative measures, this webinar will provide successful examples of using qualitative methods to evaluate this work. A pilot evaluation study that used newly developed qualitative indicators will be shared. Additionally, two specific case examples will be provided; one of a community foundation education program evaluation and one of a community health assessment on the Crow Indian Reservation. Discussion will focus on challenges and opportunities in working with organizations outside of Extension, as well as the context for applying qualitative approaches and communicating outcomes across settings. Dr. Rebecca Sero is the Evaluation Specialist for Washington State University Extension. In this position, Sero leads a statewide evaluation effort and is responsible for increasing WSU Extension's capacity to assess the effectiveness and efficiency of its programs and services. Primarily, she works closely with teams to conduct periodic, focused evaluations of major WSU Extension programs. Additionally, Sero also develops and disseminates evaluation best practices and tools for use by Extension educators and develops evaluation-related professional development opportunities. For additional information, please visit her website. Paul Lachapelle is an Associate Professor in the Department of Political Science at Montana State University-Bozeman and serves as the Extension Community Development Specialist. Working in partnership with the Local Government Center, his responsibilities involve providing research, technical assistance, and training on various community development topics in communities across the state. Specifically, he provides resources and programs in many areas including community strategic visioning, local governance, and leadership development training. The U.S. Department of Agriculture’s (USDA) National Institute of Food and Agriculture (NIFA) today announced the availability of funding to address the needs of rural Americans by providing individual and family health education programs. Funding is made through NIFA’s Rural Health and Safety Education Competitive Grant Program (RHSE). The RHSE program addresses the health and well-being of rural America through supporting projects in the food, agriculture, natural resources, and human sciences: individual and family health education programs with specified contents; rural health leadership development education programs to assist rural communities in developing health care services and facilities, and assist community leaders and public officials in understanding their roles and responsibilities; and farm safety education programs to provide information and training to farm workers, timber harvesters, and farm families. In fiscal year 2018, NIFA is soliciting applications for RHSE in the area of individual and family health education. The Centers for Disease Control and Prevention (CDC) estimates that in 2016 nearly 64,000 Americans died from a drug overdose. An overwhelming majority of these overdose deaths involved an opioid. At 174 people each day, this is more than the number of lives lost in car accidents or gun-related homicides. While no corner of the country has gone untouched by this issue, the opioid epidemic has hit rural America particularly hard. USDA is committed to being a partner to rural communities to address substance misuse disorder at the local level through program investment, strategic partnerships and best practice implementation. The Collective Impact Model has the potential for bringing organizations and partners together to address a common set of goals. This webinar will provide an overview of the model -- the contexts in which it may be useful, the strategies for making it successful, and current criticisms of its use. Evaluation strategies for assessing both the formative and summative aspects of collective impact models will also be discussed. Dan Kahl is an Assistant Professor in the Community and Leadership Development Department and Assistant Director of CEDIK at the University of Kentucky. He is an Extension Specialist in community development with an emphasis in community leadership. With visionary leadership, excellence in programming, and positive impact, Rivers has helped secure and manage more than $12 million in extramural funding to enhance Kentucky State University’s work with the small, limited-resource, minority, veteran and women farmers in the Commonwealth of Kentucky. Participants of the Small Farmers Program have shown a $5,000 annual increase per participant. His leadership has impacted more the 20,000 individuals through "Third Thursday Thing", Kentucky State University’s monthly sustainable agriculture workshop. The Excellence in Extension and National Diversity awards are sponsored by the U.S. Department of Agriculture National Institute for Food and Agriculture (USDA-NIFA) and the Cooperative Extension Section. The recording of the National CRD Indicators Team webinar, "Estimating the Economic Impact of Programs: Best Practices and Lessons Learned", is now available on the Regional Rural Development Centers website. The U.S. Department of Agriculture’s (USDA) National Institute of Food and Agriculture (NIFA) announced more than $8.6 million in available funding to assist low-income individuals and communities in developing food systems. This funding is available through NIFA’s Community Food Projects Competitive Grant Program. The primary goals of the Community Food Projects Competitive Grant Program are to meet the food needs of low-income individuals, increase the self-reliance of communities in providing for their food needs, promote comprehensive responses to local food access, farm, and nutrition issues, and meet specific state, local or neighborhood food and agricultural needs. A brief overview of approaches used to estimate program impact. How IMPLAN has been used in Extension will be shared as well as best practices and lessons learned. Presenters will be Nancy Bowen and Greg Davis. Nancy Bowen is a Community Economics Field Specialist focusing on community economic development programming and issues affecting communities throughout Ohio. Specialization areas include impact analysis, community and regional planning, BRE, entrepreneurship, and renewable energy development. Greg Davis serves as Assistant Director, Ohio State University Extension - Community Development. In this capacity he leads field-based Extension specialists and educators engaged in the development of community, organizational and individual capacity to improve civic, environmental and economic conditions throughout Ohio. On August 30, 1890, the Second Morril Act was signed into law which created the nation's historically black land-grant colleges. Today, 1890 land-grant universities are a robust network of 19 universities with a legacy of educating first-generation and economically disadvantaged college students; enhancing the resilience of limited-resourced farmers, families, individuals, and underserved communities; and conducting cutting-edge research to generate new knowledge and solutions to address local, regional, and global challenges. After 127 years of experience and diversity in agricultural research, education, and extension, our 1890 LGUs are poised to develop leadership and human capital for our nation’s preeminence in the 21st century. THEME: 75th Anniversary: "Building Bridges to a Productive, Just and Sustainable Future" The College of Agriculture, Environment and Nutrition Sciences invites the submission of papers, posters, panel discussions and workshop proposals for its 75th Annual Professional Agricultural Workers Conference. We are accepting abstracts related to the theme and other related topics. The deadline for submission is October 15, 2017. Webinar Registration Now Open: "Incorporating Health Insurance and Health Care into Farm and Ranch Viability and Risk Management"
A webinar for Extension, Tax, Loan, Health, and Other Professionals. Plan to attend and leave with tools you can use. Through national focus groups, interviews and surveys, funded by USDA: Farmers and Ranchers, Extension, Tax and Health Professionals Spoke. All agreed. Dudensing is an Associate Professor and Extension Economist for the Department of Agricultural Economics at Texas A&M University. Within her field, Dr. Dudensing has performed many annual economic impact analyses for various organizations. In her short time working in economic development, she has produced several successful publications including The Food and Fiber System and Production Agriculture’s Contributions to the Texas Economy. Dudensing has also served on a number of regional committees including Chair of the SRDC Technical and Operational Advisory Committee and the Marketing Committee Chair for the National Association of Community Development Extension Professionals (NACDEP). Kelly is a County Extension Director with North Carolina Cooperative Extension. Much of her work has been with local food system development. She implemented the Green Fields Initiative in support of the Stronger Economies Together Initiative, and as part of this initiative, also developed a regional food hub. Kelly also focused her attention on the revitalization of downtown Rockingham, North Carolina. She has also been very active with NACDEP and is currently in her second term as Southern Region Representative and member of the Board of Directors. Engaging community members to help address important issues is both rewarding and impactful. But doing this well takes considerable time investments and skill development. Is the investment worth the return? What are the potential risks to engaging and also to not engaging? This webinar will explore these questions as well as showcase recent investments in civil dialogue by the first ECOP Rapid Response Team. The SET leadership team composed of SRDC, USDA Rural Development, and Purdue Center for Regional Development is proud to announce a new round of Stronger Economies Together regions. The Phase VII regions will be receiving focused coaching from teams of Cooperative Extension Service and USDA Rural Development specialists to guide them toward development of a regional economic plan. The selected regions are North East Arkansas Economic Development Coalition (AR), South East Arkansas Economic Development District (AR), Southern Indiana Development Commission (IN), Bootheel Synergy (MO), Uwharrie Region (NC), Mid Central Rural Corridor (NM), and South Eastern New Mexico (NM). Congratulations to these regions! We look forward to sharing their success stories in the coming months. CDC has recently launched a rural health web portal. The portal, which will expand throughout the year, intends to provide an entry point into all of CDC’s rural health science, diseases prevention tools, and resources for organizations working in rural America. In 2017, CDC has issued the first reports in a year-long series on rural health in the Morbidity and Mortality Weekly Report. The series tackles many aspects of rural health. The data signal opportunities for improved public health programs that support healthier behaviors and neighborhoods, and better access to healthcare services. This information will help CDC and partners in state, local, and tribal communities understand the disparities between rural and urban populations. Additional information on these disparities could increase targeted implementation of effective public health programs to improve the health of rural Americans. Deaths of Despair in Pennsylvania and Beyond: A Demographer’s Take on Drug, Alcohol and Suicide Mortality in Small City and Rural America. This webinar will describe trends in drug, alcohol, and suicide mortality in the U.S., explore some of the potential explanations for why rates have increased over the past 2 decades and why these deaths are more prevalent in certain geographic areas, and discuss what it will take to counter these trends. The webinar will also explore the role that community-level illness and despair played in the 2016 U.S. Presidential Election. No registration needed. How Does Health Insurance Affect Farmers and Ranchers? Help Influence Rural Health Policy in Upcoming Survey. Farmers and ranchers: How does health insurance affect you? Help influence rural health policy by participating in an upcoming USDA funded survey. Your responses will help researchers understand how health-insurance policy affects farmers’ and ranchers’ decisions to invest, expand, and grow their enterprises. This survey is a chance for farmers and ranchers to make their voices heard about their experiences with health insurance and how that affects both their economic development and family’s quality of life. Throughout 2017, the Centers for Disease Control and Prevention (CDC) will highlight rural healthcare issues in a special series of the Morbidity and Mortality Weekly Report (MMWR). Covered so far are the leading causes of death in metropolitan and non-metropolitan areas, and health-related behaviors classified by county. Upcoming topics may include chronic diseases, healthy behaviors, reproductive health, injuries and exposures, and agriculture safety and health. A 2-part webinar series is scheduled for all of Extension to learn more about a new partnership between Cooperative Extension and the Robert Wood Johnson Foundation. The purpose of the 10-year partnership is to build a Culture of Health in communities across America in 2017 and beyond. In March, Cooperative Extension Section institutions can apply. Five will be selected as pilots this summer to launch the program. All institutions will have the chance to engage in other ways, including professional development opportunities. Each year, the SRDC honors someone who has excelled in community development work within Extension Service in the South. On odd numbered years, we seek to honor a person with the Bonnie Teater Community Development Early Career Achievement award. Nominations are now being accepted. Please consider nominating someone that has excelled in this arena. The nominee must be currently employed by one of the 29 land-grant universities located in the Southern Rural Development Center region, serve as an administrator, specialist or agent who has worked in the Extension CD area for 10 years or less; and have an impressive portfolio of Extension-related programs and publications. The conference theme this year is “Todos Juntos: Collaboration and Unity in Uncertain Times.” Todos Juntos means “all together”, and seeks to build collaboration across sectors and unite communities across differences in the common goal of supporting everyone’s wellbeing in our changing, multicultural communities. Diversity is our strength, especially when we work together, and now is the time for collaboration across disciplines, silos, sectors, perspectives and cultures to create bridges of opportunity. The conference will be held June 14-16, 2017 in St. Louis, Missouri. The U.S. Department of Agriculture's (USDA) Agricultural Marketing Service (AMS) today announced the availability of $27 million in grants to fund innovative projects designed to strengthen market opportunities for local and regional food producers and businesses. AMS today announced the request for applications for the Farmers Market and Local Food Promotion Program, which includes Farmers Market Promotion Program (FMPP) and Local Food Promotion Program (LFPP) grants, and the Federal-State Marketing Improvement Program (FSMIP). These programs and other resources across USDA are helping to revitalize rural America by supporting local and regional food stakeholders. The Foundations of Practice course, Sustainable Communities, offers you the tools, skills and knowledge to be the trusted resource community groups need in the emerging dialogs around local foods, energy and natural resources. This training, brought to you by the Cooperative Extension System and the Regional Rural Development Centers, provides the background, resources and strategies to support your work in communities. The eight-week series begins February 2, 2017. Each week features a 90-minute webinar focusing on timely topics including Energy, Local Foods, Built Environments, Mobility and Natural Resources. The eXtension Foundation is seeking proposals for 35 projects focused on improving Diversity and Inclusion within Cooperative Extension, its partners, and the public. We are seeking projects that can have a visible, measurable impact at the local level. The eXtension Issue Corps process combines virtual and face-to-face events (a designathon) and experiences to assist in project development, program innovation, use of technology, innovative design, problem solving, and gaining expertise focused on the solutions needed.. The Community Development Society (CDS) and the National Association of Community Development Extension Professionals (NACDEP) are requesting proposals for refereed presentations and posters relating to community development. Submissions relating to the joint conference theme, "Big Skies: Bold Partnerships-Moving Mountains Together" are encouraged, but all submissions will be given full consideration. The conference will take place on June 11-14, 2017 in Big Sky, Montana. One success we've already see through the SET program is in Oklahoma where the Drying Canola Project was able to diversify agriculture, produce better crops and will gain an estimated $7.2 million in additional income. This is just one of the many success stories we have seen from the 84 SET regions around the country. USDA Rural Development held a Webinar September 22nd discussing four of many of Stronger Economies Together's success stories. The four regions that were highlighted are The Northern Neck Region in Virginia, Badlands Bad River Region in South Dakota, I-40 Corridor in Wester Oklahoma, and SET Forever Region in Northeast Louisiana. Coble, a 19-year veteran of Mississippi State, has taken on the role of department head after previously serving as interim head for the last eight months. Coble holds a teaching appointment in the College of Agriculture and Life Sciences, a research appointment in the Mississippi Agricultural and Forestry Experiment Station, and an outreach appointment in the MSU Extension Service. Coble earned bachelor’s and master’s degrees in agricultural education from the University of Missouri. He earned a doctoral degree in agricultural economics from Texas A&M University and also served as chief economist for Sen. Thad Cochran. September is “Rural Development Month” at the Department of Agriculture (USDA), and USDA’s Rural Business-Cooperative Service (RBS) is holding a series of informational webinars to share success stories and best practices on how customers and partner organizations have used RBS programs and resources to support businesses in rural and Tribal communities. Customers and stakeholders interested in learning more about RBS programs—and how customers have used our financing tools to support entrepreneurship—are encouraged to participate in this opportunity to engage with diverse partner organizations, ask questions, and learn more. For additional information, or to request special accommodations, please contact rdced@wdc.usda.gov. SRDC would like to congratulate all of the national and regional winners of the 2016 National Association of Community Development Extension Professionals Awards. 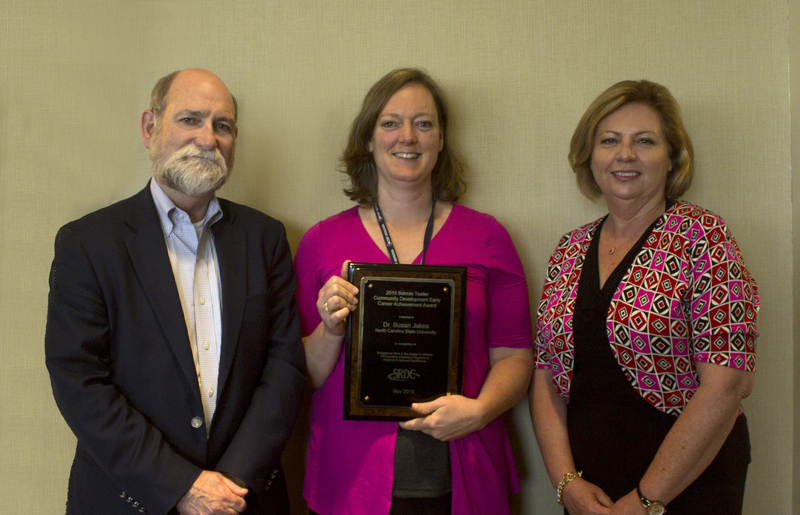 We would like to especially recognize Southern winners, members of the CEDIK Team and the Center for Leadership Development from the University of Kentucky, for receiving several national and regional awards. A special shout-out goes to Marisa Aull who received both the National and Southern Regional Cross-Program Award as well as the National JCEP Professional of the Year Award. After reviewing the applications the State Resource Team has announced the regions that will be obtaining technical assistance through Stronger Economies Together, Phase VI: North Central Indiana Regional Planning Council (IN), Ozark Foothills (MO), East Central New Mexico (NM), Central South Carolina SET Collaborative (SC), Glacial Lakes (SD), Texas Forest Country Partnership (TX) and 7 Rivers Alliance-Monroe, Juneau, Jackson (WI). One region, Region 4 Northern Collaboration (MI), will receive pilot training through Leaders in Economic Alliance and Development (LEAD), a technical assistance program. The USDA's Food Availability Date System has been studying the "Changing American Diet". The program can estimate how much foods are being produced and how much people are eating, dating from 1970 to 2013. In the major food categories we can see a progression of certain food items from year to year. For example, a major increase in the use of cooking oil happened in 2000, and chicken became the most consumed meat in 2004. The Innovative Dads Program uses local fathers from churches, who are trained by me and a local Pastor (Gerard Duncan) who is a building maintenance superintendent, to perform repairs to homes in under served areas of Gainesville, FL. The fathers gain access to elderly residents€™ homes in the area because they are trusted due to the Pastor's connections to the neighborhoods. Further, the fathers bring local youth into the homes to observe the upgrades so the youth can learn how to repair homes and also learn the trust and bond being created within their neighborhood by working in elderly folks' homes. This program aims to reduce the number of elderly residents who visit the emergency room due to accidental falls in the home and to reduce the number of youth who otherwise would be out on the local streets looking for something to do after school hours, which typically leads to negative behavior. Land grant university programs helped keep farmers on the farm: Federal cooperative extension programs have helped more than 137,000 farmers stay in business since 1985, according to economists. In a study, the researchers said that 137,700 farmers would have left the industry without the federal program, which uses research from the country's land grant universities to provide education and learning opportunities to farmers and other citizens. Without cooperative extension, and the underlying research, the researchers estimated that the country would have lost 28 percent more farmers than actually left agriculture. The Southern Rural Development Center hosted the Value-Added Producer Grant Webinar on March 10th, 2016. Rural Development staff provided an overview of the Value-Added Producer Grant (VAPG) program, including purpose, basic program requirements, and resources, preparing participants for introductory outreach to potential applicants and stakeholder groups. The recording of the webinar is listed below. Tracey Kennedy, VAPG Program Lead, Rural Business Cooperative Service. Tracey has been involved with the RBS Grants Division since 2006. Prior to that she served as an Agricultural Economist specializing in international trade and horticultural and specialty crop marketing in the Agricultural Cooperative Service. Shantelle Gordon, Management Analyst, Rural Business Cooperative Service. Shantelle has been with the VAPG program since 2014. Prior to that she served as a Program Analyst for Rural Development Single Family Housing Programs including Section 502 Loans, 504 Grants and 523 Technical Assistance Grants. Agriculture Secretary Tom Vilsack today announced that the USDA Rural Child Poverty Nutrition Center at the University of Kentucky awarded $1.3 million in grants to help reduce child food insecurity in 17 rural communities. The funding, ranging from $50,000 to $100,000, will help these rural communities implement creative strategies to improve access to federal nutrition assistance for families and children. Secretary Vilsack made the announcement during a panel discussion on the current state of food and nutrition in America hosted by the Bipartisan Policy Center.